We’re halfway through March which can only mean one thing – time for another Daring Cooks challenge! This month Melbournefood Geek and Jess the Baker have set us the task of creating a risotto from scratch, complete with homemade chicken stock. I’ve made my fair share of risottos and find the joy is not only in the eating, but also in the cooking – it’s such a luxury to set aside half an hour just to stir a quietly simmering risotto to creamy perfection. As a rule I use fresh stock, but it tends to be store bought, so I was interested to see how using my own homemade stock would compare. To be honest I didn’t see a huge difference, although it is rather satisfying making your own. I’ve noted down the white truffle oil (added at the end) as optional, but I highly recommend that you don’t omit it – it lends a seductive heady scent that elevates the dish to something really special. Cut the butternut squash into small dice (about 1/4 inch), then cook in simmering water for 2-3 minutes, until tender. Drain and set aside. In a small saucepan heat the chicken stock until it reaches a gentle simmer, then keep warm on a low flame. Add half the olive oil to a larger saucepan on a medium flame and saute the onions for a few minutes until soft and translucent. Add the risotto rice, cook and stir well to coat for about a minute then add a ladle of chicken stock, stirring and cooking on a strong simmer until the stock has absorbed, then add another ladle of stock and repeat. Keep cooking in this manner (making sure each addition of stock has been adsorbed by the rice before adding the next) until the rice is creamy, tender and cooked through (but still with a bite). This should take just under 20 minutes, and you may be left with some unused stock. Make sure the finished risotto is still quite wet and not too dry (if it is just add a splash of stock and stir through). Remove from heat and stir in the squash, parmesan and 1 tbsp of the butter. Season with salt and black pepper to taste and leave (covered) in a warm place while you cook your scallops. Dry the scallops with a paper towel (this ensures they sear and colour nicely) and lightly season with salt. Heat the remaining olive oil in a heavy based frying pan on a medium flame until hot, then saute the scallops for about a minute on each side until golden and cooked through (if you’re using the larger diver scallops, allow 2-3 minutes for each side). Remove scallops and keep warm. To the same pan add the remaining 2 tbsp of butter and cook until it sizzles and starts to colour (take care not to let it burn). Add the sage and continue cooking for another minute until the butter is fragrant and the leaves have crisped up slightly. Remove from heat and stir in the truffle oil (if using). To plate up, first scoop the risotto onto warm serving plats and spread out with the back of a spoon. Arrange the scallops over the bed of rice, then drizzle over some truffled sage butter to serve. Wash the chicken and bones and place in a large (5 litre/1 gallon) stock pot, then fill with water to cover. Bring to a boil, skimming away any scum that rises to the surface. Once boiling, add the vegetables and bring back to a boil, then throw in the remaining ingredients. Simmer gently on a low flame (uncovered) for 1 1/2 hours. Carefully lift out the chicken and set aside (the chicken meat can be shredded and reserved for future use). Simmer the stock gently for another hour, after which you should be left with roughly 2 litres (8 cups) of rich stock. *any extra stock can be frozen for later use. ~ by gourmettraveller on March 14, 2010. Another beautiful risotto! I love the combination you have going here and can’t wait to try this. Saved! Lovely! I saw this over at the DC forum and was drooling! Love the addition of the truffle oil! I love this dish!! Your scallops look amazing on top of that creamy risotto. This is on my list of things to make. I have to agree, those scallops look delicious on top of a perfect risotto. I’m not a big scallop person, but they look good. Your risotto sounds scrumptious…mmmmm. why not make it without the scallops? some sautéed wild mushrooms would make a lovely substitute! 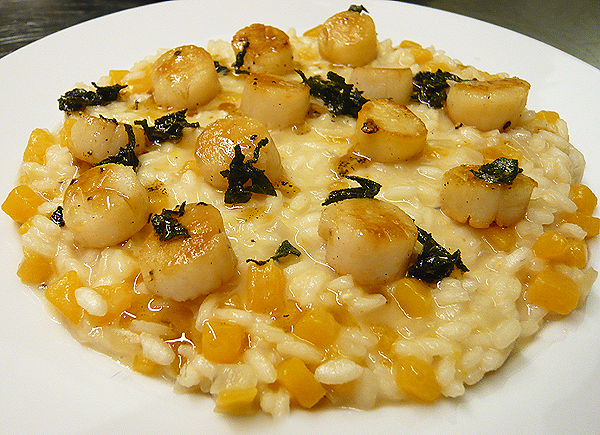 I think your butternut squash – scallop risotto just blew my mind. Not only does it look amazing, but the flavors are phenomenal. Those perfectly seared scallops are calling to me! scallops, squash and sage is such a lovely combination isn’t it? so glad it came out great for you and that everyone loved it!